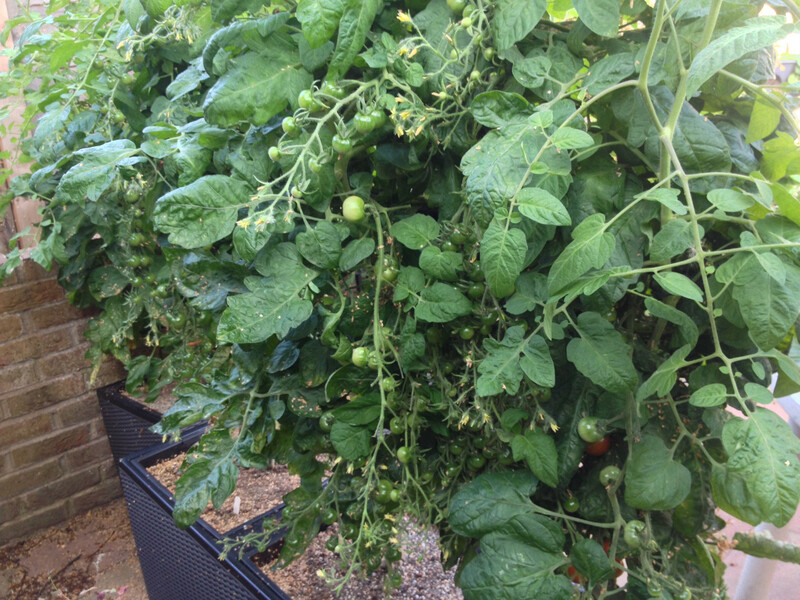 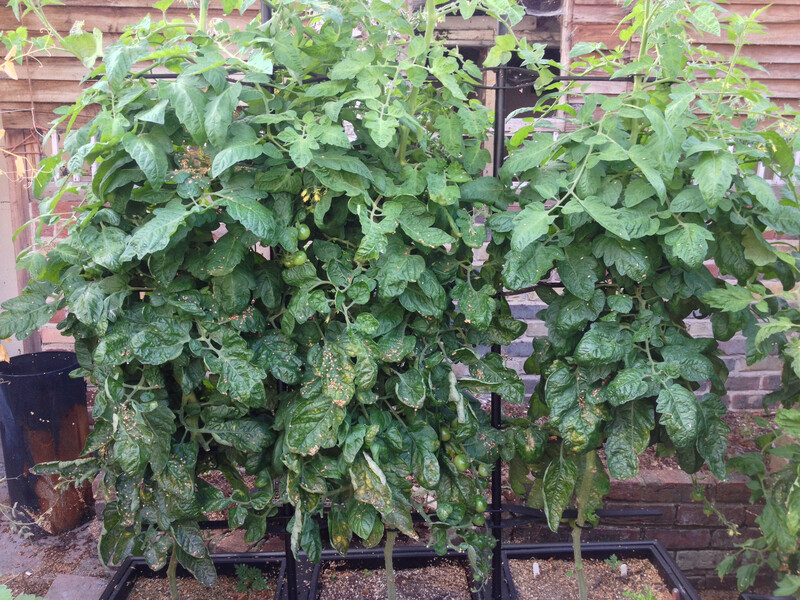 Lots of trusses of Irish Gardeners Delight cherry tomatoes on the reverse side of the plants. On the reverse side of the Irish Gardeners Delight plants, lots of trusses of cherry tomatoes with some tomatoes starting to ripen. 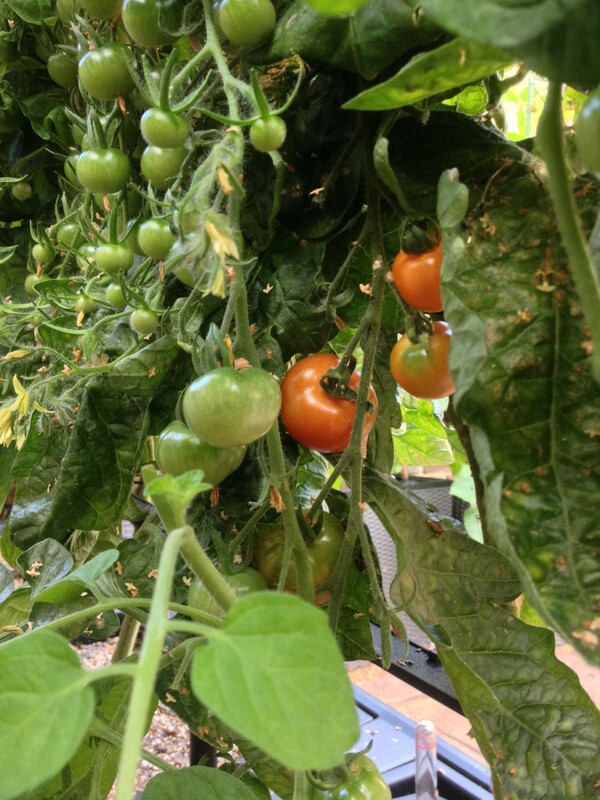 A truss of Irish Gardeners Delight cherry tomatoes. 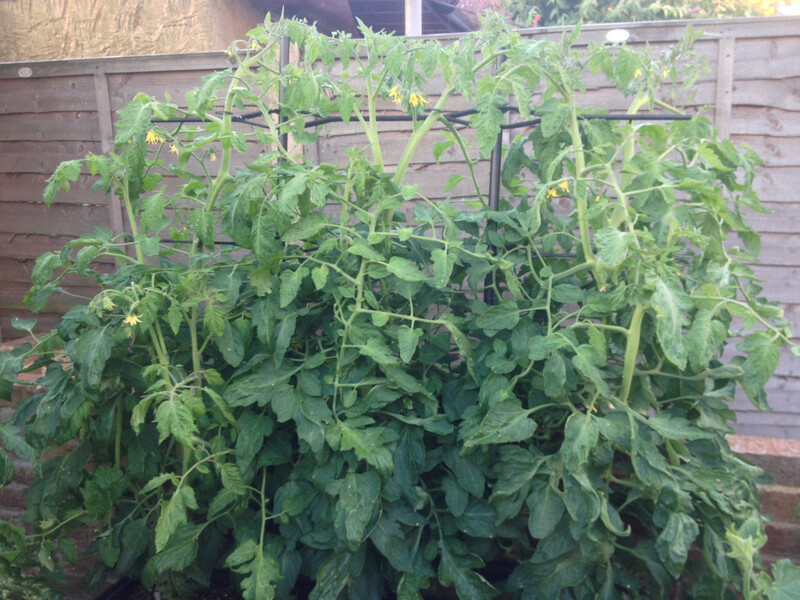 A truss of large Rose de Berne salad tomatoes. 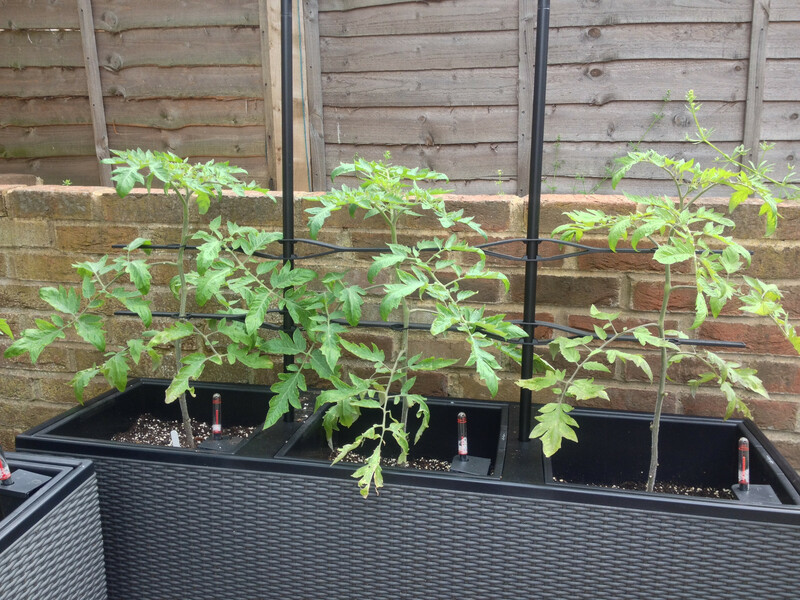 Flowering and fruiting Irish Gardeners Delight tomato plants. 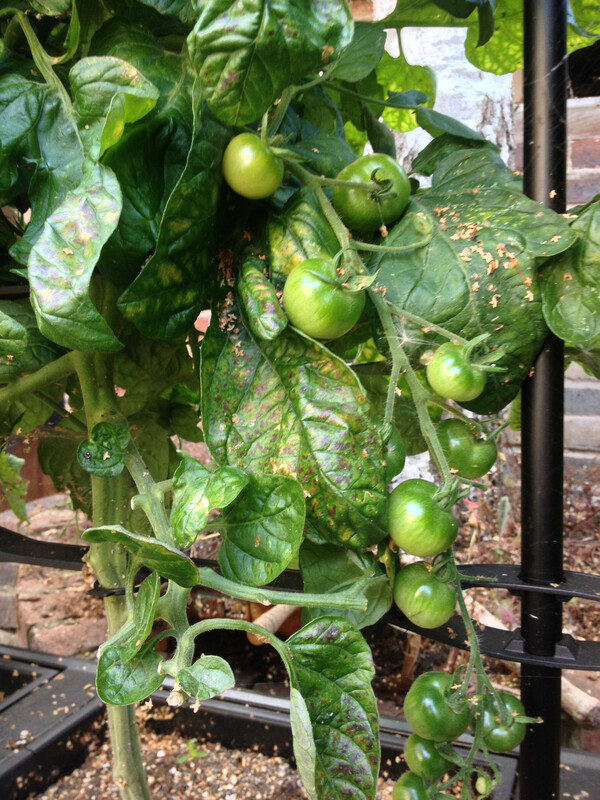 Some of the leaves look like they have late tomato blight. 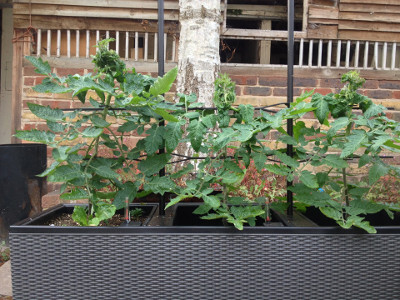 Flowering and fruiting Rose de Berne salad tomato plants. The size and weight of the plants is becoming unmanageable. 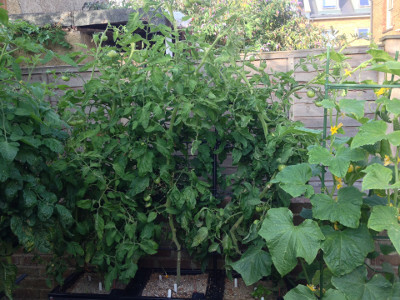 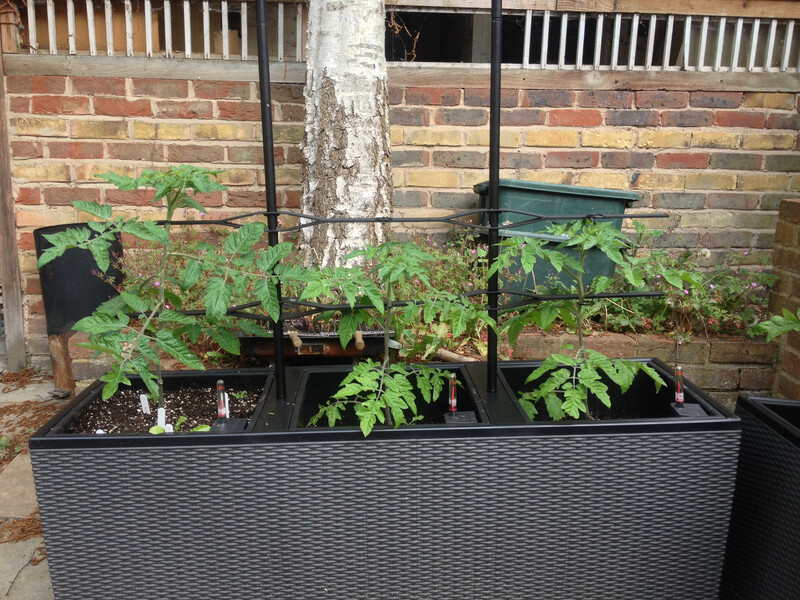 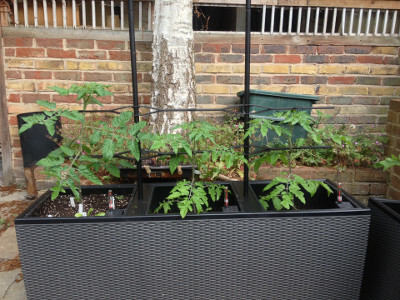 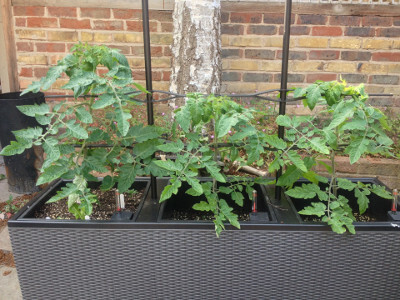 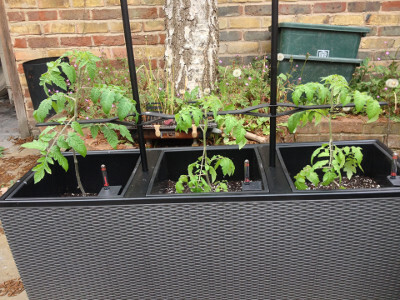 The fruit on the first truss of Irish Gardeners Delight cherry tomatoes (the left-most plant) are gradually growing in size. 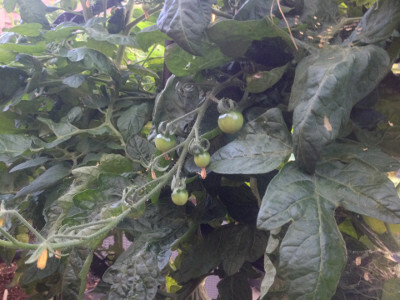 A truss of Rose de Berne salad tomatoes with some developing fruit. 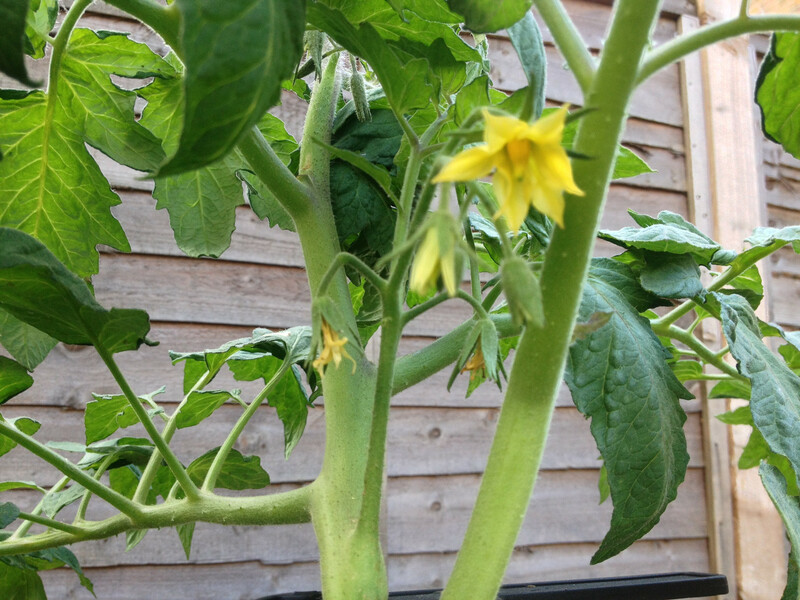 Flowering and fruiting Irish Gardeners Delight tomato plants are getting taller. 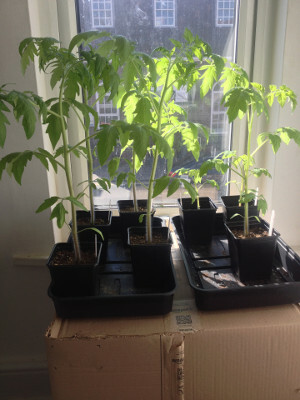 The plants need some branches removed to increase airflow. Flowering and fruiting Rose de Berne salad tomato plants. Some of the main stems have reached the top of the trellis and will soon need the tops pinched out. 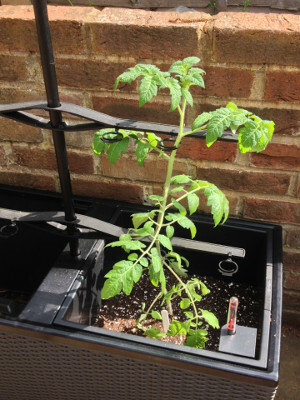 The plants also need some branches removed to increase airflow. 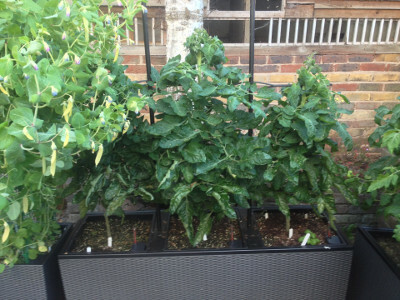 Flowering and fruiting Irish Gardeners Delight cherry tomatoes are gradually getting taller. Flowering and fruiting Rose de Berne salad tomato plants getting bigger. 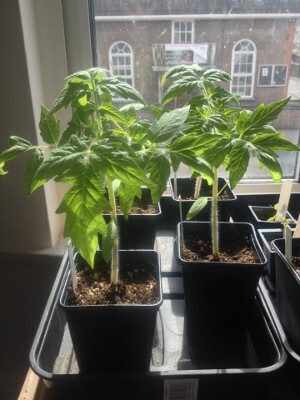 Each plant has multiple main stems. 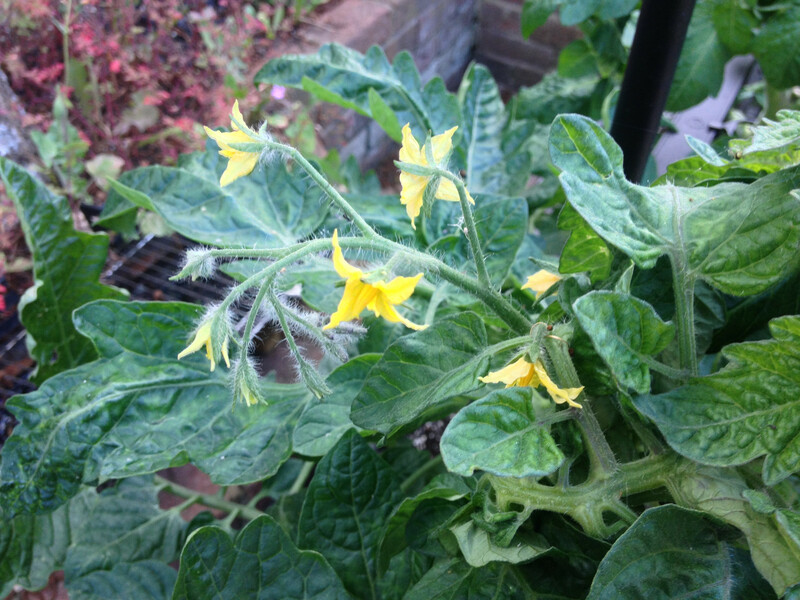 More flowers have opened on the first truss of an Irish Gardeners Delight tomato plant. 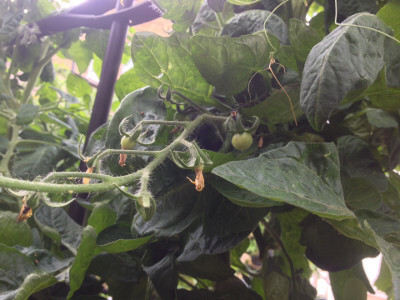 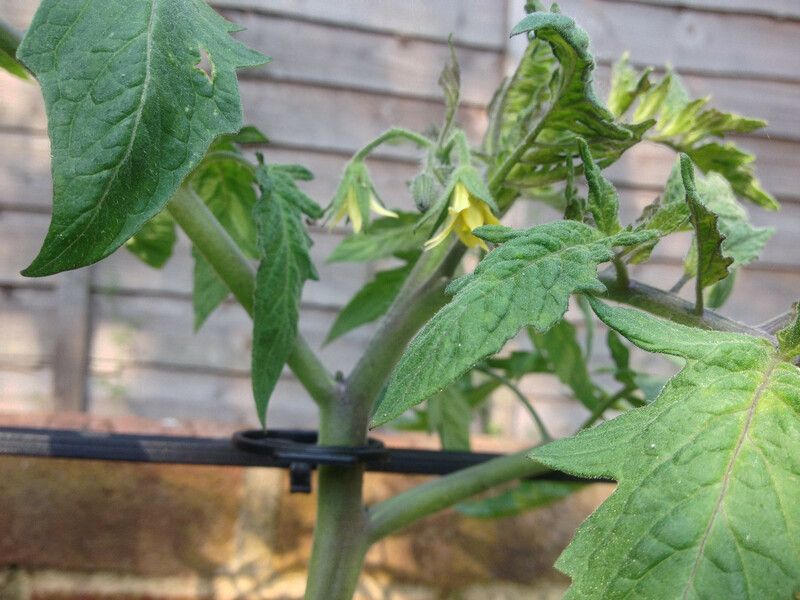 The first truss of flowers on a Rose de Berne tomato plant, with part of the second truss visible (top centre). 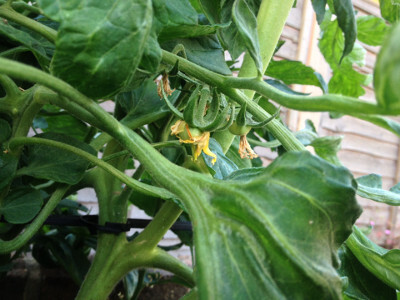 The petals on the first two flowers on the first truss have started to wither, so the first fruit will soon be visible. 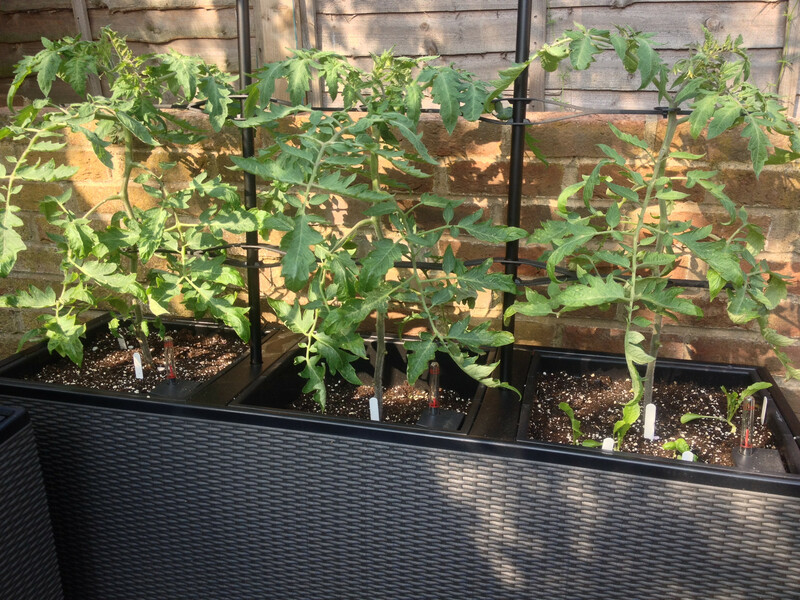 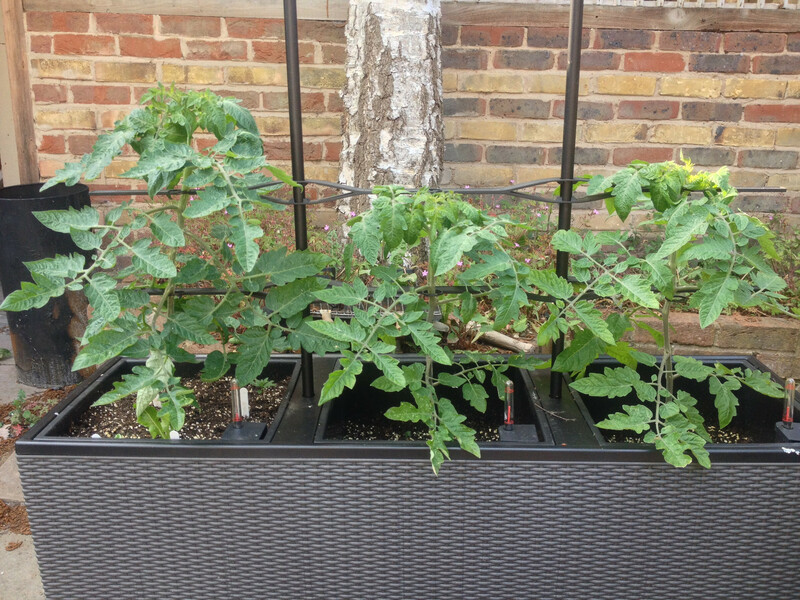 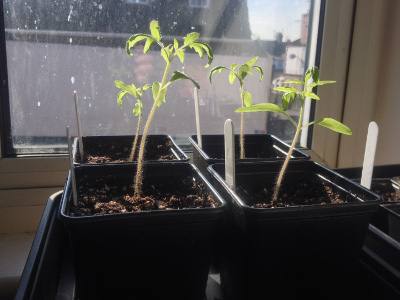 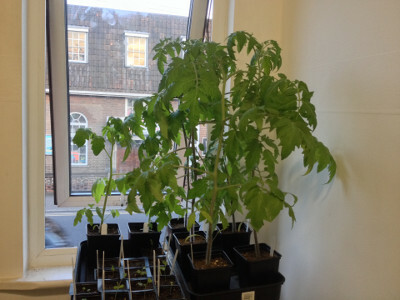 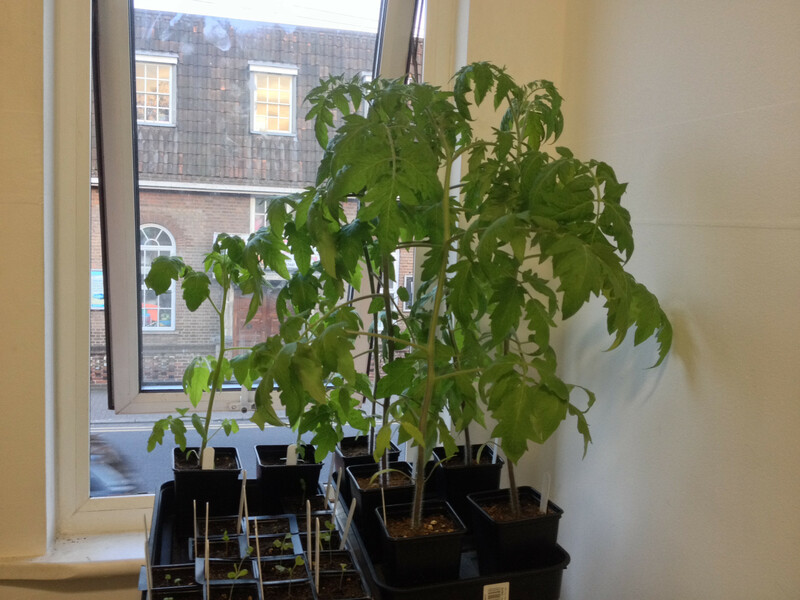 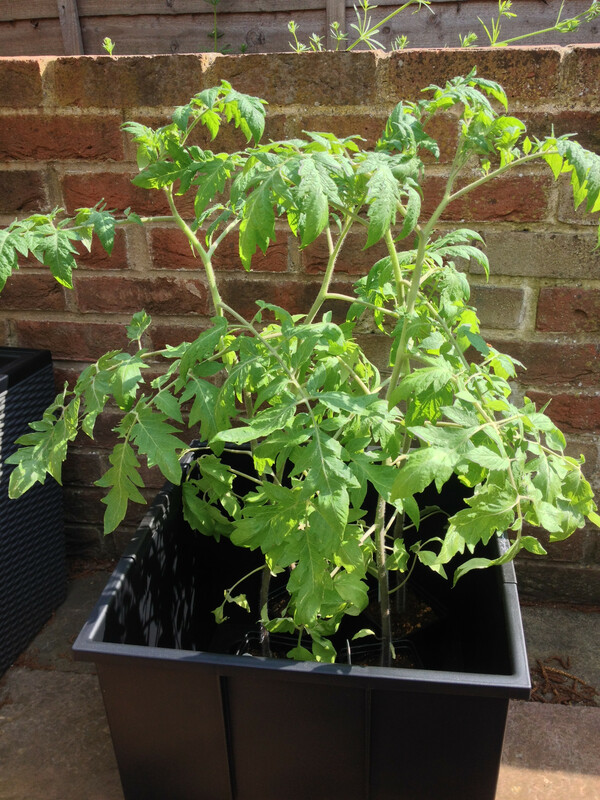 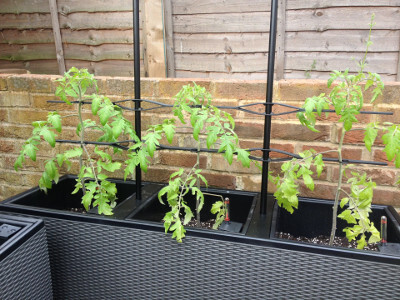 Irish Gardeners Delight tomato plants getting bigger despite very curly top growth. 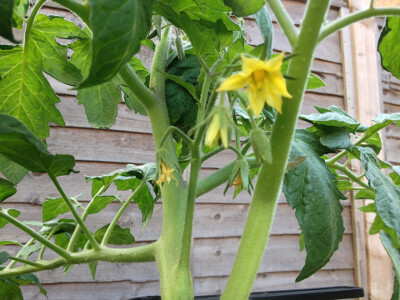 The first truss of flowers on the left plant have started to open, although the other two plants aren't quite there yet. 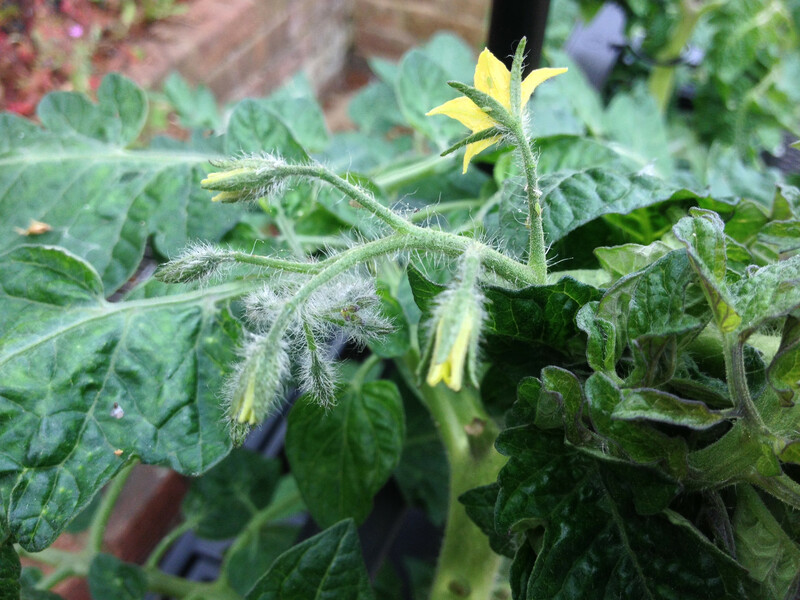 Rose de Berne tomato plants getting bigger, with the first trusses of flowers opening, and developing their third trusses of flower buds. First truss of flowers on an Irish Gardeners Delight tomato plant have started to open. 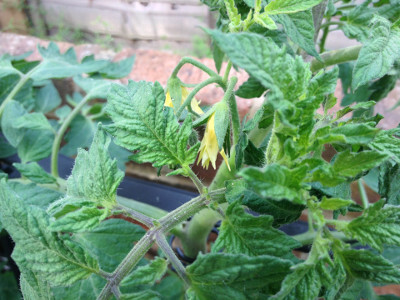 First truss of flowers on a Rose de Berne tomato plant have started to open. 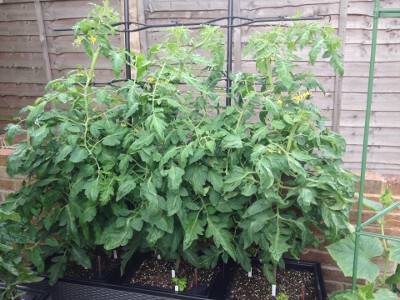 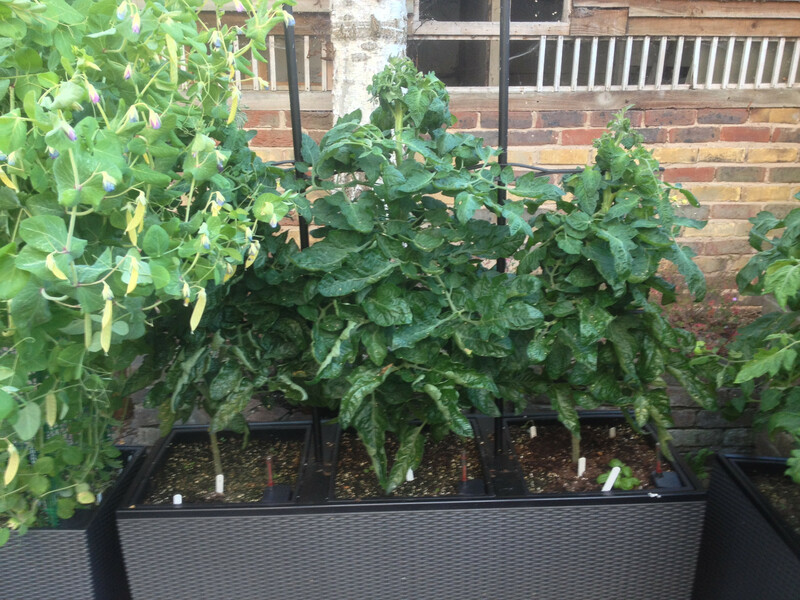 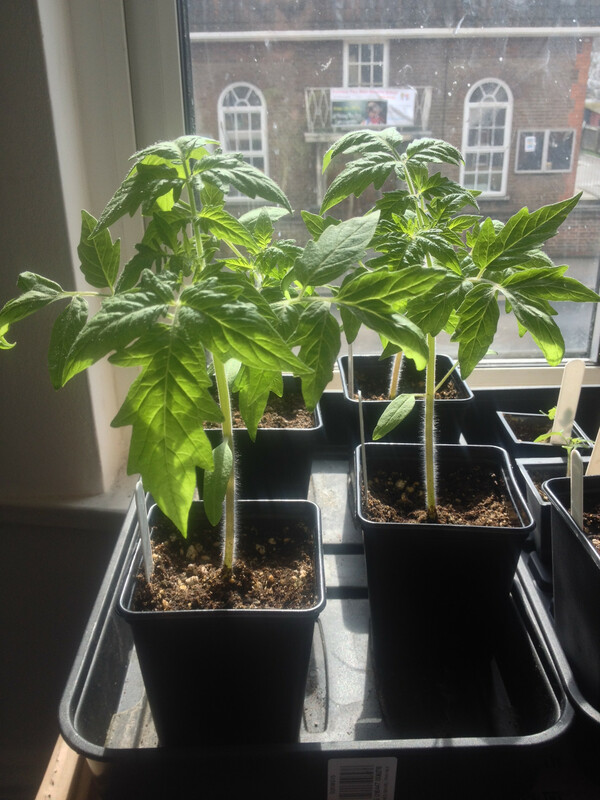 Irish Gardeners Delight tomato plants getting bigger, with developing flower buds and flowers. 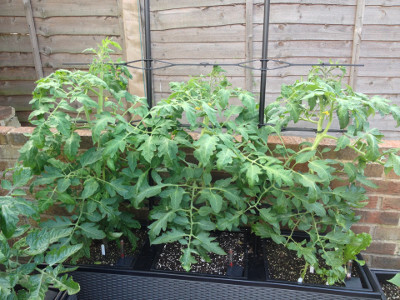 Rose de Berne tomato plants getting bigger, with deveoping flower buds and flowers. 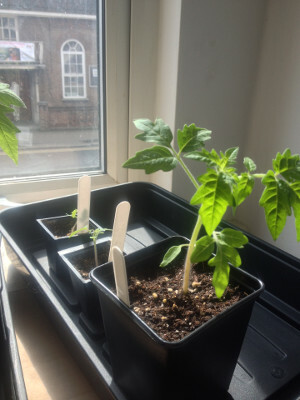 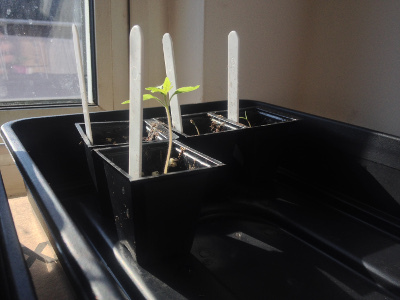 Cuttings (removed suckers) from a Rose de Berne tomato plant and an Irish Gardeners Delight tomato plant, pushed in soil to see if they will grow. 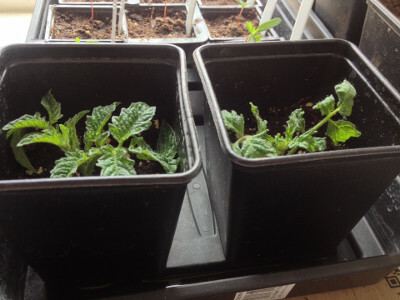 Unlabelled, but the larger of the two is the Irish Gardeners Delight cutting. 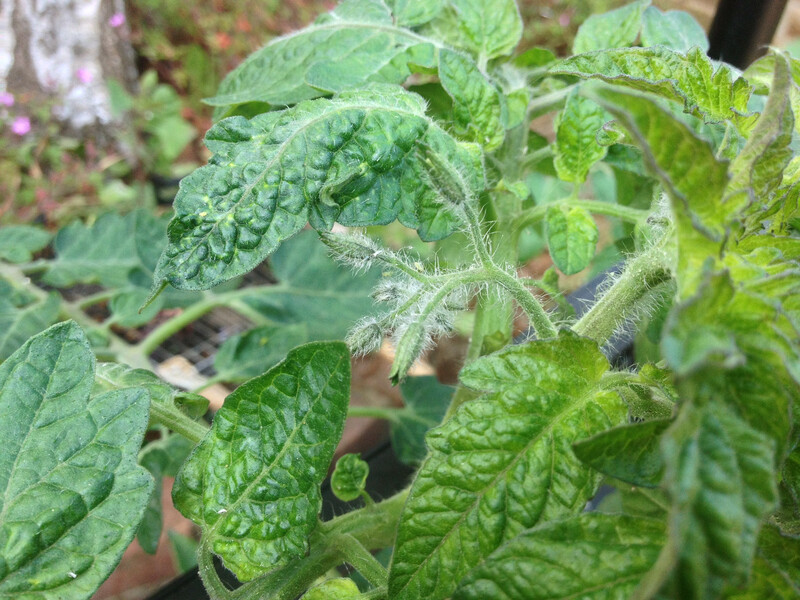 First truss of flower buds developing on an Irish Gardeners Delight tomato plant. 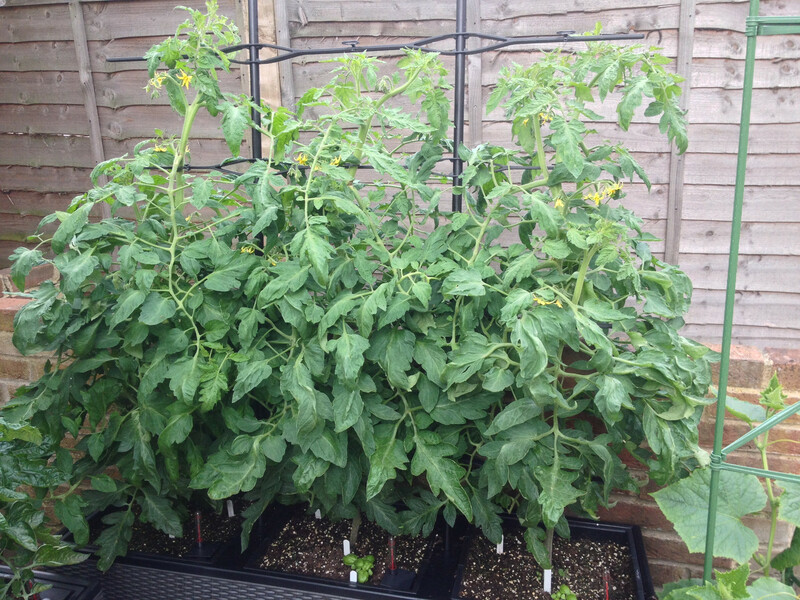 Irish Gardeners Delight tomato plants getting bigger, with developing flower buds. 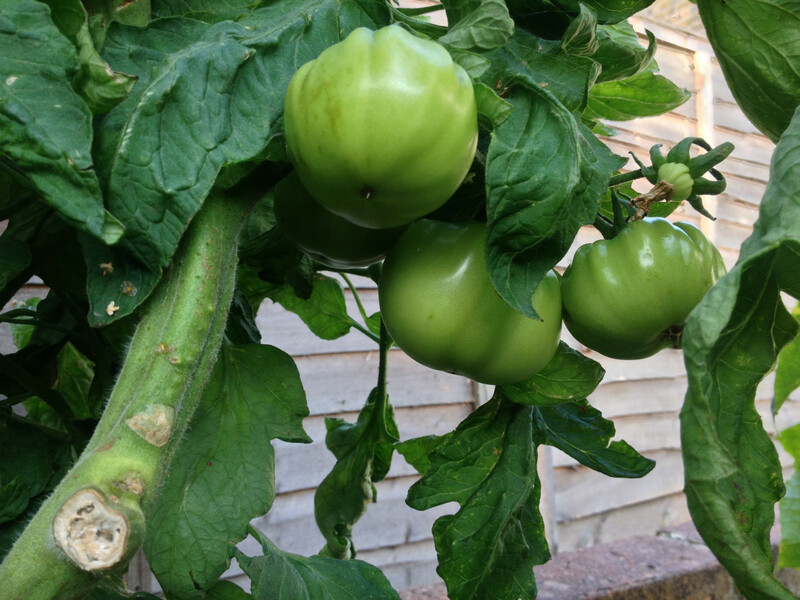 Irish Gardeners Delight tomato plants gradually getting bigger, with developing flower buds. Rose de Berne tomato plants gradually getting bigger, with deveoping flower buds looking a bit diseased. Irish Gardeners Delight seedlings planted out. 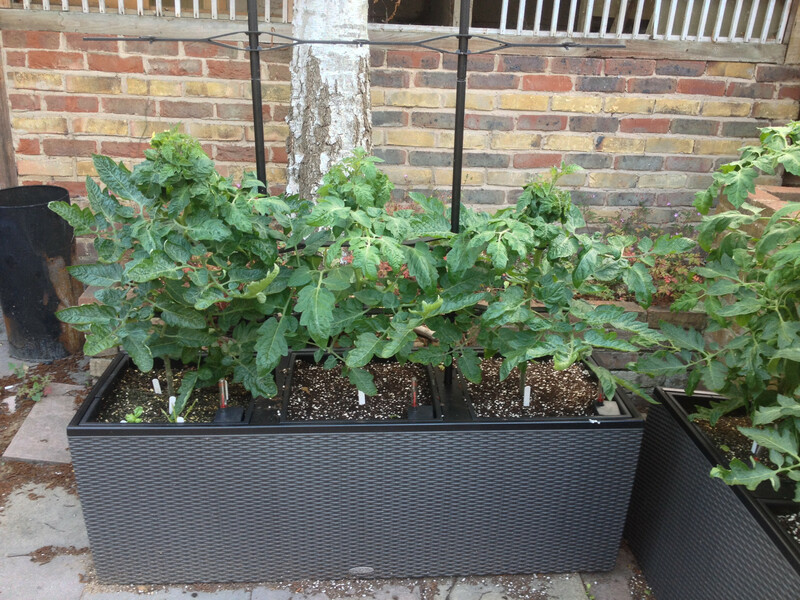 Rose de Berne seedlings planted out. 3 Rose de Berne seedlings (plus a spare) being hardened off. An Irish Gardeners Delight seedling planted out. 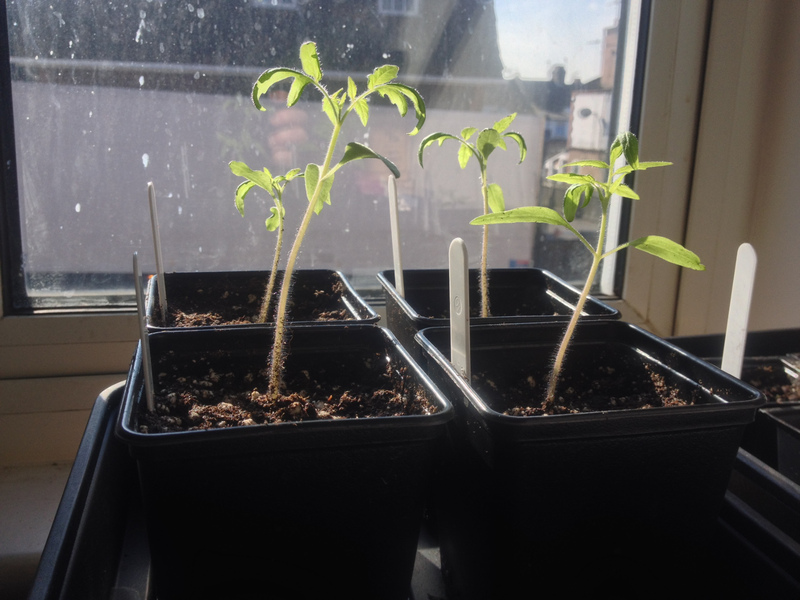 The two Irish Gardeners Delight seedlings on the left are slowly growing. 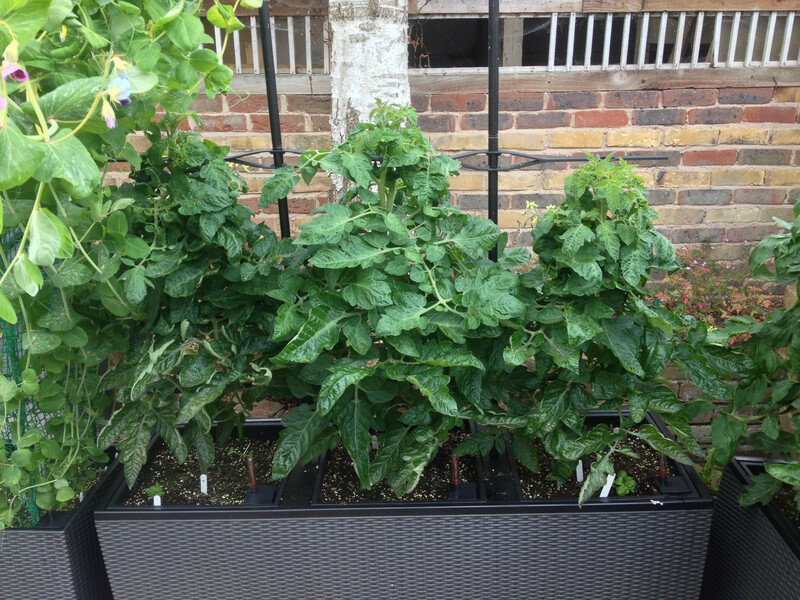 Rose de Berne are now two feet tall. Two Irish Gardeners Delight seedlings gradually getting bigger. 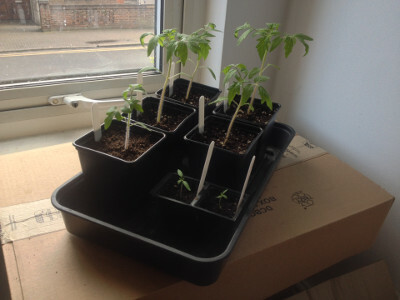 Irish Gardeners Delight seedlings are slowly growing. Rose de Berne getting even bigger. Irish Gardeners Delight seedlings are slowly growing. 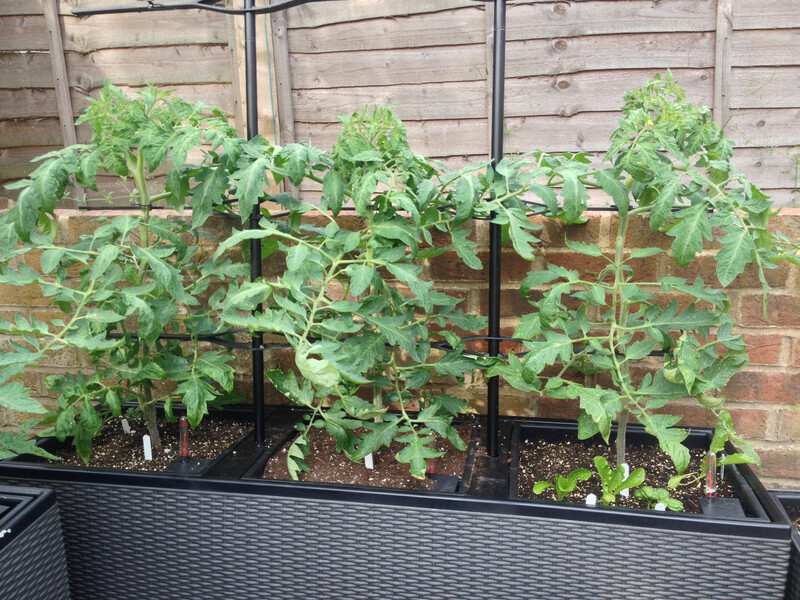 Rose de Berne getting bigger. 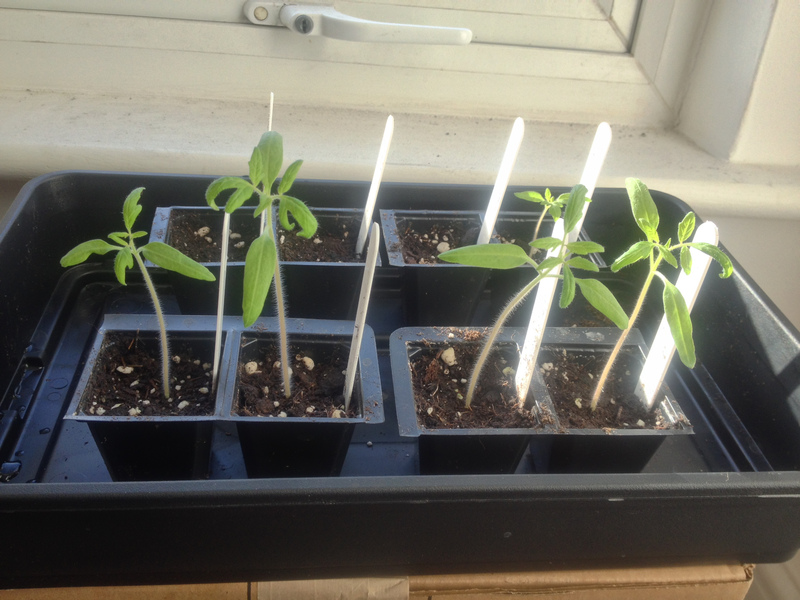 Rose de Berne seedlings are getting big. 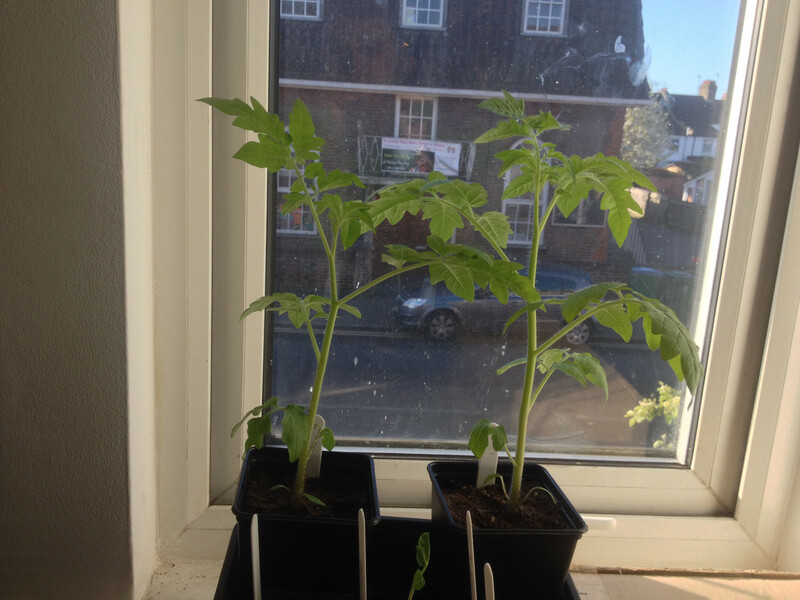 One Irish Gardeners Delight is a bit small, the other two are growing very slowly. 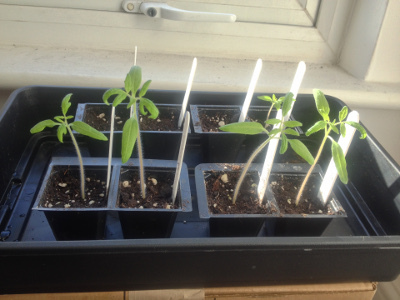 The 4 Rose de Berne seedlings are getting their third set of true leaves. 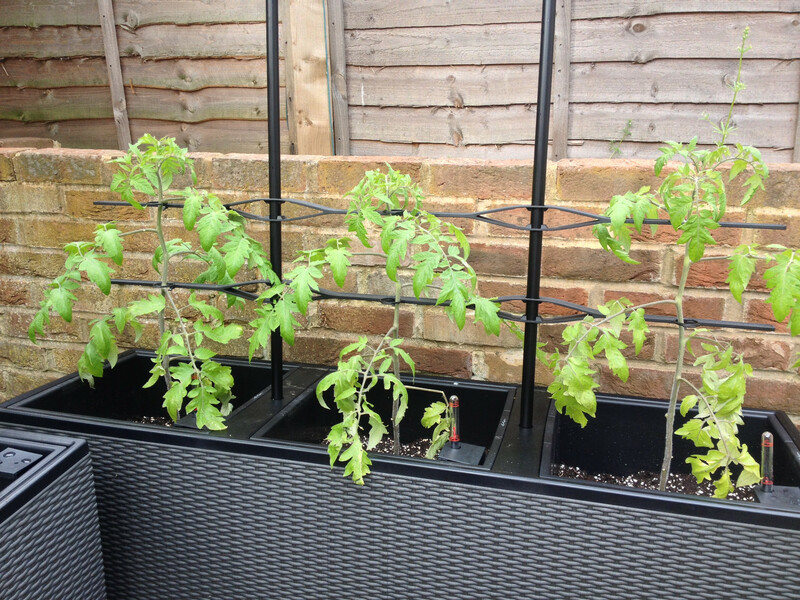 The 3 Irish Gardeners Delight aren't growing that much. 3 Irish Gardeners Delight seedlings are growing. 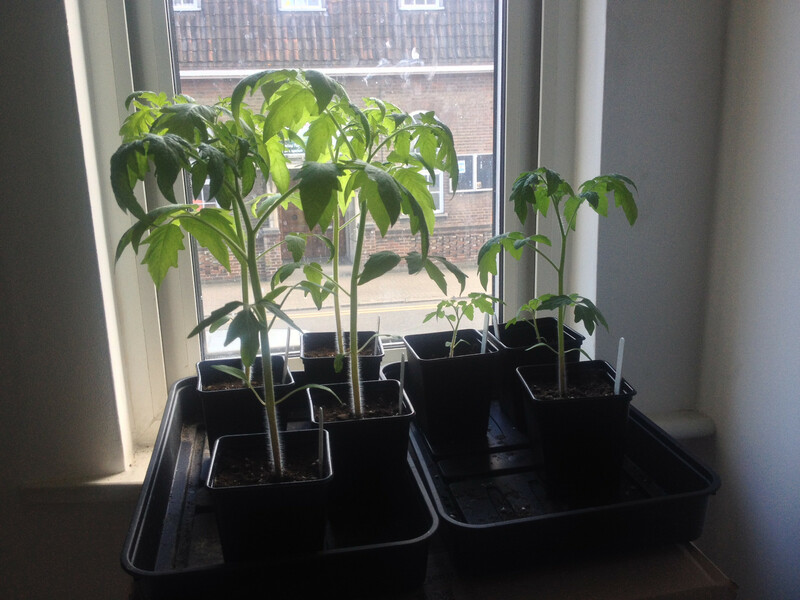 Rose de Berne seedlings potted up. 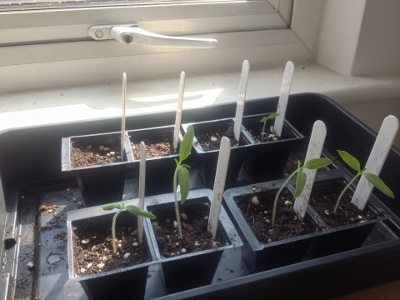 Rose de Berne seedlings need potting up; Still only 1 Irish Gardeners Delight seed has germinated. The first true leaves are noticeable. 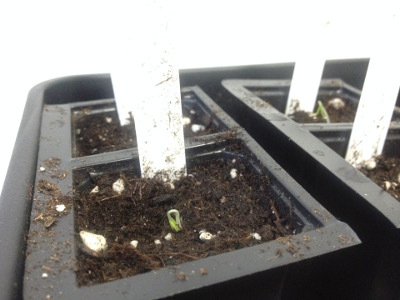 The first cotyledons break the surface.